University of Virginia, Environmental Science- B.A. University of Maine, Oceanography – M.S. 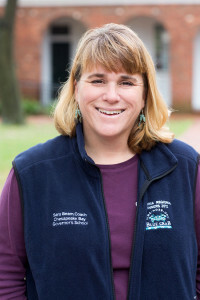 Mrs. Beam has been teaching marine and environmental science for over 25 years, with Chesapeake Bay Foundation, the Barrier Island Environmental Education Center, and the University of Maine (where she attended graduate school). Mrs. Beam has swum with sea lions in the Galapagos, seen blue whales in the Gulf Stream, and climbed to the summit of Mt. Kenya in east Africa twice! 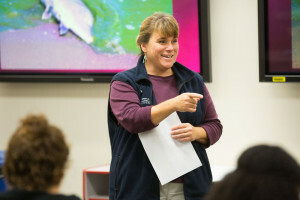 Mrs. Beam brings her this diverse outdoor and educational experience to CBGS, where she teaches Foundations of Science and Marine & Environmental Science I & II. She believes that pairing classroom work with field studies allows educators “to give context and reality to classroom learning and add sensory understanding to the science we are learning”. The fun memories students and teachers alike make on these trips also helps to solidify concepts. Mrs. Beam laughingly remembers when her husband (who also teaches at CBGS) flipped over her kayak in a salt marsh on a CBGS field study. Mrs. Beam is looking forward to making more memories with CBGS students and adding them to the CBGS family. “I have two children of my own, but my CBGS family is always growing!” she says.